FIE Certified Fencing 800N Sabre Gloves (CE Approved) usable for all 3 Weapons (Epee, Foil & Sabre) manufactured by RIK SPORTS approved by FIE recommended Lab Critt Sport, Certified by FIE, made in Pakistan with excellent quality Approved 800N Fabric with excellent quality superb CE approved Amara Rubberized Silicone Grippe Palm, Reinforcement at Palm, Thumb & First Finger, Closed Bodycord as per new FIE rules, Excellent quality genuine stretched material ensures good fit, Back 800N Fabric with high density extra Foam Padded in order to keep inside hands safe, 800N Fabric in between fingers, Kevlar thread for cut resistance, Lame Electric Sabre Fabric Cuff at bottom Closed with Velcro, Piping in between fabric & cuff, Inside Cuff FIE instructed label. Certificate available on our web also For Certifications reference you can visit FIE web onto the list of FIE 800N Sabre Gloves official supplier. 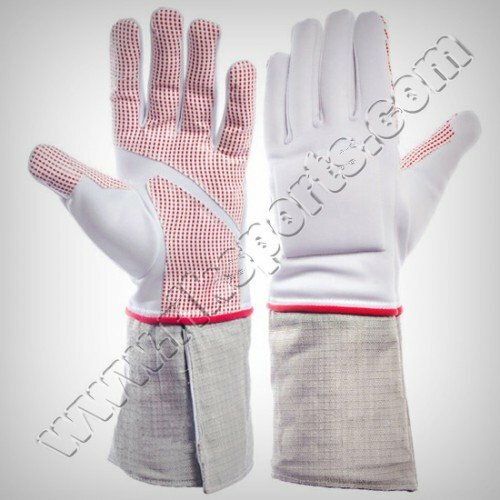 Range of Application The 800N Sabre Glove is designed for use in the sport of Fencing As per rules of the International Fencing Federation ( F.I.E ) Correct level of Performance for Protective Gloves for Fencers Please refer to rules of your national Fencing Federation. We strictly recommend to only use the level 2 for a better protection. Fencing 800N Sabre Gloves of the highest level of performance ( NF EN 13567+A1 08/2007 level 2). The zones of protection of this protective garment Can be seen from the appropriate figure on the cover page. The following parts of the garment are not part of the protective zones: All fastening devices like Straps, Velcro etc. When Fastening your 800N Sabre Gloves: Make sure that all fastening devices ( Straps, Velcros, etc. ) are closed completely and firmly. The Gloves may bot be used any longer, if any of the fastening devices doesn’t work properly. Warnings Fencing by virtue of being a combat sport in which body contact by the weapon occurs, is by its nature dangerous. Protective clothing and equipment for fencers is intended as far as possible to prevent injuries, or in the worst cases to reduce the severity of injuries, particularly by the point of the weapon. Broken blades pose a particular threat. The circumstances of the breakage of blades may result in high tip velocities and consequent high energy impacts by the broken blade. Broken blades have been known to penetrate protective equipment with fatal consequences . No practical clothing is capable of withstanding all broken blade impacts. Protective clothing must not be changed or manipulated. In particular seems must not be opened or further parts be added or taken away. Caring instructions must be respected. Non-respect of these instructions can reduce the level of protection of this garment. Carefully inspect protective clothing for Fencing at regular intervals to make sure, that no mechanical defects ( Like abrasion, holes, broken seems, tears, scratches ) have occured. If this has happened, the garment may no longer be used. Fencing clothing is designed to only be used by either left handers or right handers ( see marking on the cover page ). Fencing clothing for right handers must not be used by left handers and vice Versa. Caring & Storing Instructions This garment can be washed at 40 C in a mild detergent. Don’t spin-dry or tumble this garment, as the mechanical impacts might reduce its level of protection. All closures have to be closed during washing. To be stored in its original packing in a cool & dry place without direct light exposure. Measure around your hand in inches corresponds to your glove size. Please take your round palm measurement (Please do not include thumb) and add 0.5".For example if your hand measures 9 inches around its widest point (excluding the thumb). You would add half an inch to establish glove size as 9½.